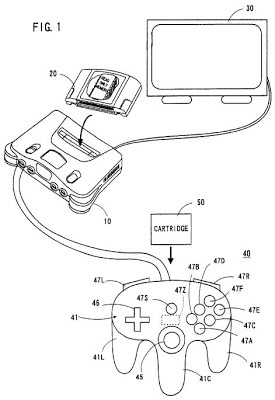 The ‘073 patent allows a player to lock his character onto a non-player object with the press of a button (the ‘Z’ button when playing the Nintendo 64). Once a player presses the Z button, the camera will automatically adjust so as to give the player the best view of the object he has locked on to and thus make it easier to see or attack that object. The camera is designed to go behind the player and give him a forward-facing view of the action which allows him to see the non-player object in front of him clearer. A video game apparatus includes an RCP. The RCP performs a conversion process on image data to display a player object or non-player object according to image data transferred from an external ROM to a RAM, and supplies the image signal through the display. The RCP detects whether or not there exists a non-player object at around the player object on the display in response to an operation of a Z button. If a non-player object is detected, the RCP selects the non-player object as an attention non-player object. At this time, the hypothetical camera is changed in position and photographing direction such that photographing can be made for the player object directly facing the non-player object. a camera controller for changing the position of said hypothetical camera such that photographing can be made on the player object directly facing the attention non-player object selected by said selector.